A LEADING HOUSING organisation has criticised the length of time taken to prepare social housing for new occupants after figures showed units in some counties have been left vacant for over a year. The Simon Communities of Ireland said there was a need to identify whether delays in social housing provision were down to a lack of resources or staffing. Information obtained by RTÉ indicates that property in four areas – Cork county, Kerry, Leitrim and Roscommon – can remain empty for an average of over 12 months. In Cork county, for example, units were typically unoccupied in 2014 for 66 weeks after tenants moved out. There are shorter turnarounds in more urban areas, with the four local authorities in Dublin passing over “voids” or vacant properties within just under three months, on average. Some of the county councils told the broadcaster that major delays were down to the need for substantial renovation of older housing. 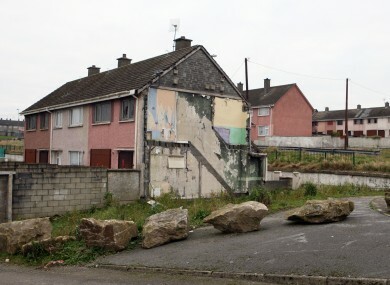 Others, in Donegal and Leitrim, for example, cited a lack of demand for properties in rural areas. A spokesperson for the Department of Environment told TheJournal.ie that it had provided councils with significant funding to deal with boarded-up units over the past two years. The spokesperson said 2,700 vacant properties were brought back into use in 2015 through a state-funded construction scheme. Some 2,300 units were made available to new tenants in 2014, meanwhile. Figures relating to vacant social housing have been skewed by the amount of repair work required to bring a small number of older properties up to standard, the spokesperson added. However, Niamh Randall of the Simon Communities said no vacant home should take over a year to turn around. She said a national register is needed to take stock of the number of empty units in different parts of the country. “We need some mechanism to track and monitor the number of voids moving in and out of the system, to assess what areas are taking longer and why that is,” Randall told TheJournal.ie. We need to set targets and timelines, and incentivise local authorities to deliver on them. Councils should also consider partnering with housing association to deliver units in a speedier manner, she said. Meanwhile, a national domestic violence charity has warned that the scale of the housing crisis has been underestimated because of the exclusion of women and children in refuge accommodation from homelessness figures. The 4,000 people accepted into emergency refuges every year are not counted and recognised as being homeless, Safe Ireland said. A further 4,831 requests for refuge had to be turned down in 2014 due to a lack of space in shelters. Government figures at the end of February showed that 912 families, with 1,881 children, were in emergency homeless accommodation. Email “Some social housing left empty for over a year before new families can move in”. Feedback on “Some social housing left empty for over a year before new families can move in”.